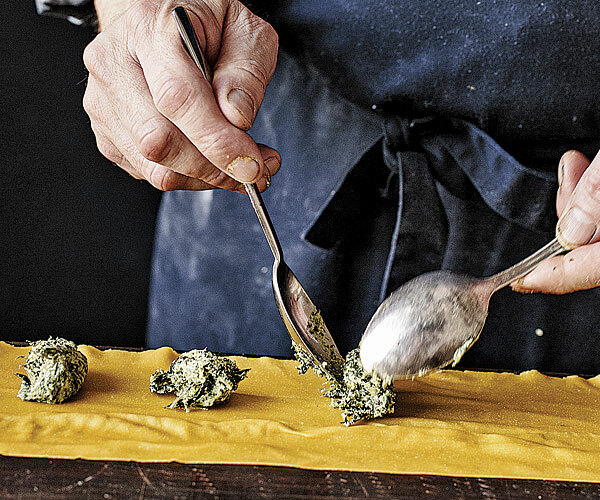 Chef Michael Tusk reveals the secrets to his swoonworthy stuffed pasta. On my first trip to Italy as a young cook, I had dinner in the small town of Savigno in the hills southwest of Bologna. 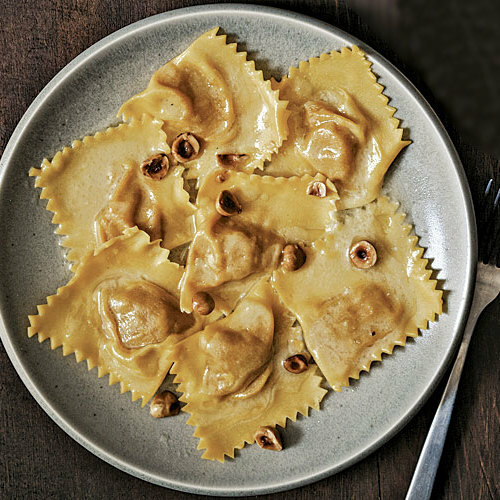 White truffles, which the town is famous for, were the featured ingredient on that cold November night, but it was the pasta, a single raviolo floating in a bowl of brodo that left a lasting impression. Filled with spinach, ricotta, and a whole egg yolk, it revealed a gorgeous molten yellow when I cut into it. 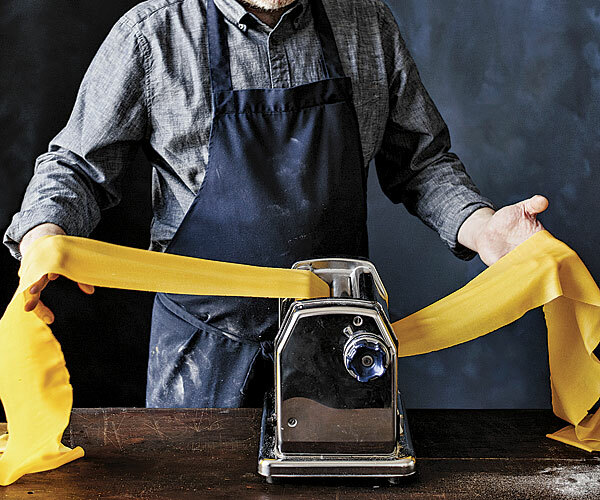 At that moment, I decided to learn as much as I possibly could about pasta. Over the years, I did just that, returning to Italy often during my tenures at Chez Panisse in Berkeley, California, and Oliveto in Oakland. 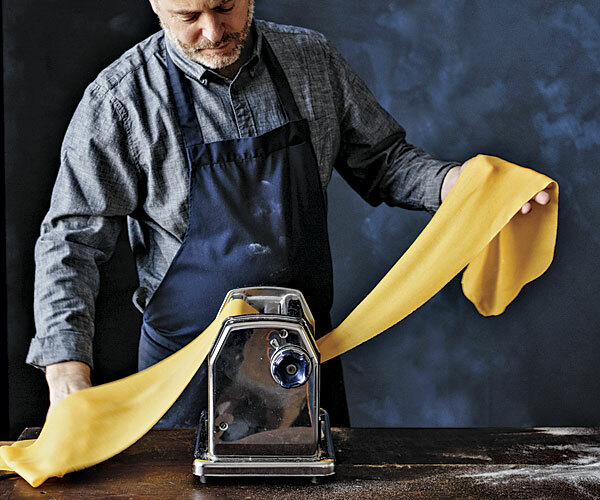 By the time I opened Quince, my San Francisco restaurant, in 2003, I knew that handmade pasta, including ravioli inspired by that early bite in Savigno, would be an important part of the menu. 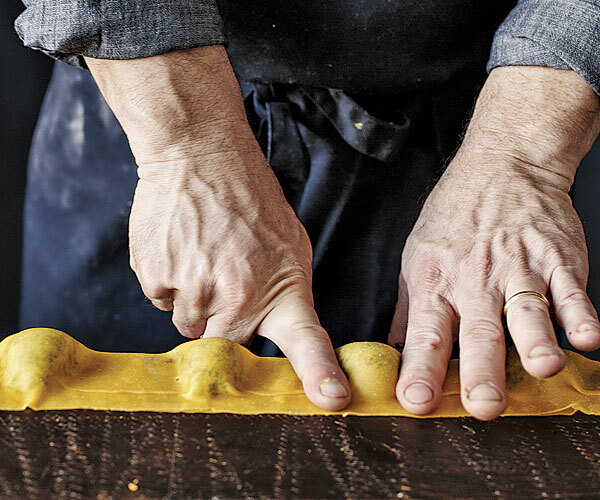 Though there is a mystique surrounding the making of fresh ravioli, it’s not difficult to do, and the payoff—your own customized filling, the tender pasta, and even the slight irregularity of the shapes that broadcast that it’s handmade—is well worth the effort. 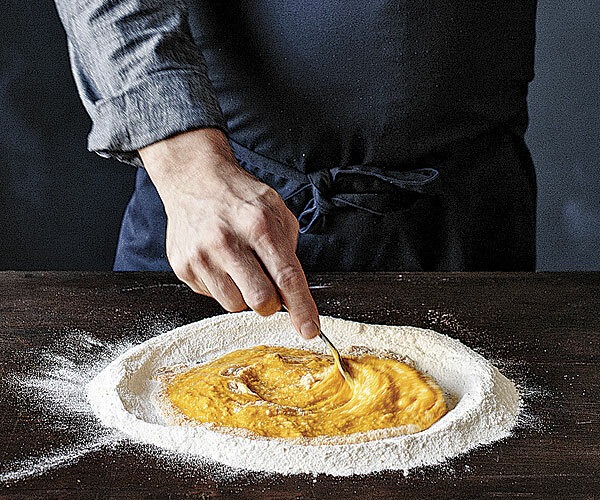 Egg yolks plus a little egg white make a tender dough that’s easy to handle. 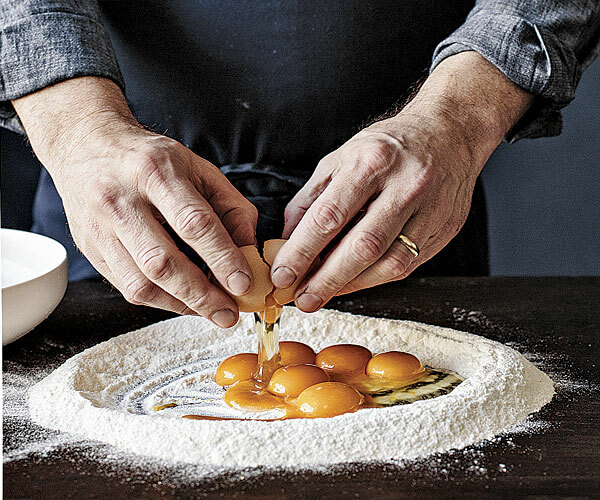 Though I love the richness of egg-yolk-only pasta, for ravioli, I also include a whole egg in the dough. The egg white makes the dough a bit more elastic, which is especially important when I’m stretching the dough over a filling. 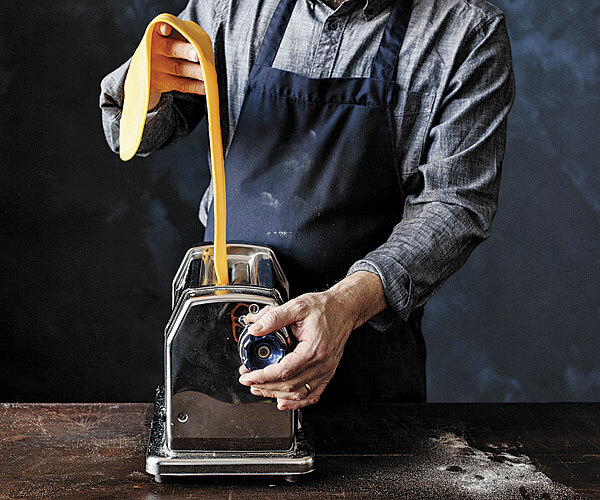 Deeply colored egg yolks will give the pasta a golden hue. Mixing by hand gives you a feel for the dough. One of the most important lessons I’ve learned about making pasta is that it’s an inexact art. Because of variations in egg size or humidity, you may use more or less flour. Mixing by hand allows you to easily gauge when you have added enough flour to make a supple dough. After you have mixed the eggs and flour together, it’s important to knead the dough to develop the gluten that makes it strong and smooth. It’s almost impossible to overknead, so err on the side of more and not less. 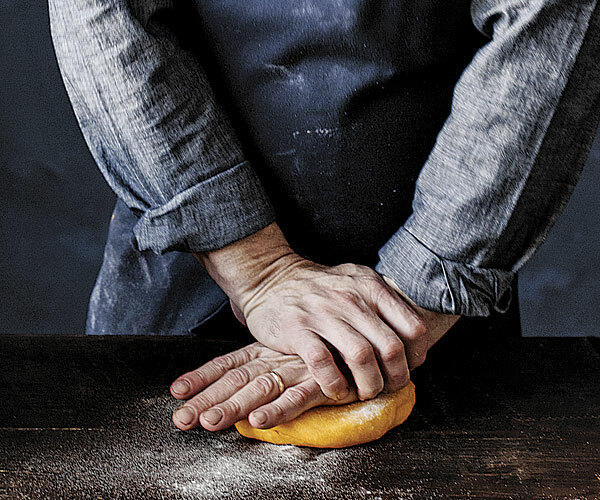 A rest after kneading helps hydrate the flour, which will also help it to stand up to rolling and shaping without cracking. Make your filling while the dough rests. 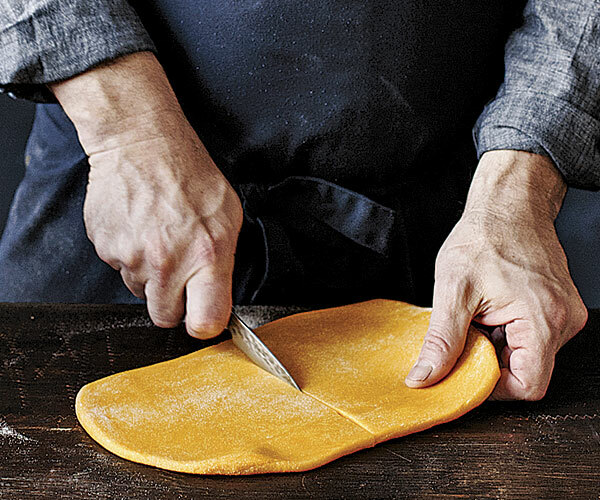 You’ll need your filling on hand when you roll out the pasta, so have it made ahead. I kept the fillings simple (though flavorful) in order to keep the focus here more on the making of the ravioli itself. Dump the flours on a work surface and mix to combine them. Make a deep, wide well in the center, making sure there is some flour on the bottom so the eggs are not directly on the surface. Add the egg yolks, whole egg, oil, and salt. Using a fork, beat the wet ingredients until combined, staying in the center and being careful that the eggs don’t breach the wall. Begin mixing in the flour from the inside of the wall, a little at a time, until the dough is too stiff to mix with the fork. Scrape the dough off the fork and continue mixing by hand, folding it and forming it into a single mass. Lightly flour the work surface and knead the dough for at least 5 minutes, adding more flour as needed. 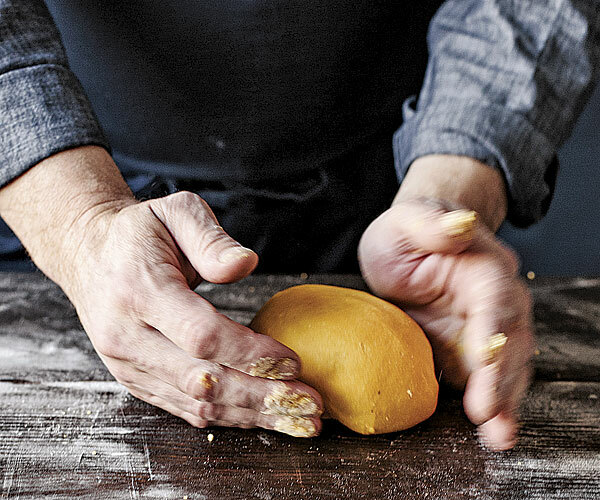 Continue kneading until the dough is a smooth ball that feels soft like your earlobe. 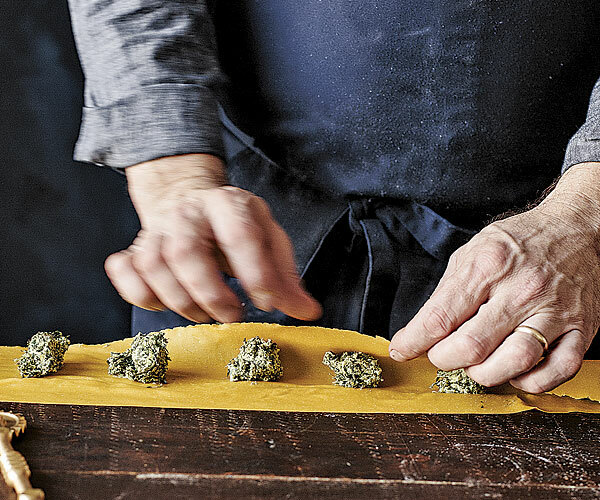 A pasta machine makes rolling easy. I recently catered a friend’s wedding reception. When I arrived at the site, I realized that I’d neglected to bring the proper pasta roller for the tortelloni I had planned to make. With little time to spare, I drove furiously up and down Highway 1 near Big Sur looking for a restaurant that had a pasta roller, but no luck. I ended up rolling out all the dough by hand with a rolling pin. 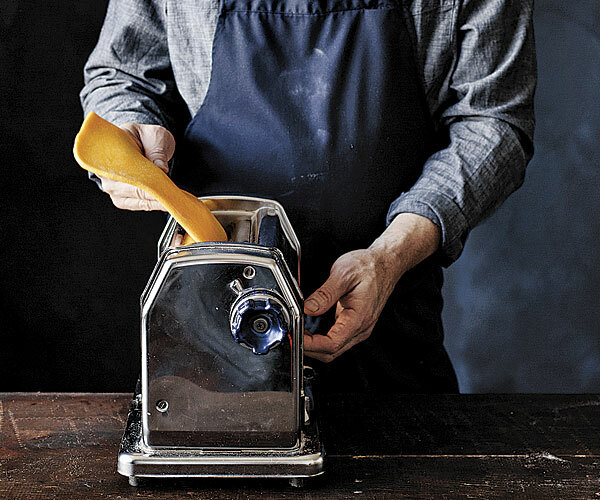 The moral of this story: A pasta machine is not a necessity, but it makes the job go a lot faster. When filling ravioli, eliminate air and seal well. 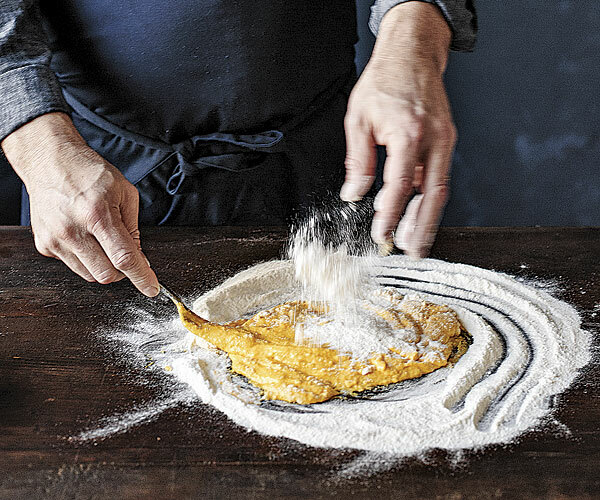 While you can vary the shape and size of ravioli (and I encourage you to explore doing so), you always want to eliminate any excess air by gently pressing on the dough around the filling before sealing; otherwise the ravioli may balloon when cooked. A good seal, made by lightly moistening the dough and pressing it firmly closed, is also important for keeping the filling inside, which is where you want it to stay until that first delicious bite. Flatten the dough with your hand or a rolling pin and divide it into pieces. If you’re comfortable rolling dough, in half is fine; otherwise divide it into 3 or 4 pieces to get shorter sheets. Working with one piece at a time and keeping the other pieces wrapped in plastic or a cloth, run the dough through the widest setting on the machine a couple of times, flouring as needed, to work the dough. Move the rollers to the next setting and pass the dough through. Continue notching down by one setting and passing the dough through each time. Stop rolling when you can see the outline of your hand thorough the dough; this may not be the thinnest setting on some machines. Cut the sheet crosswise into 2-foot lengths to make them easier to work with and trim the long sides to make neat rectangles. Cover loosely with plastic wrap. Repeat with the remaining pieces of pasta. Clear off your work surface so it’s just you, the pasta machine, and the dough. 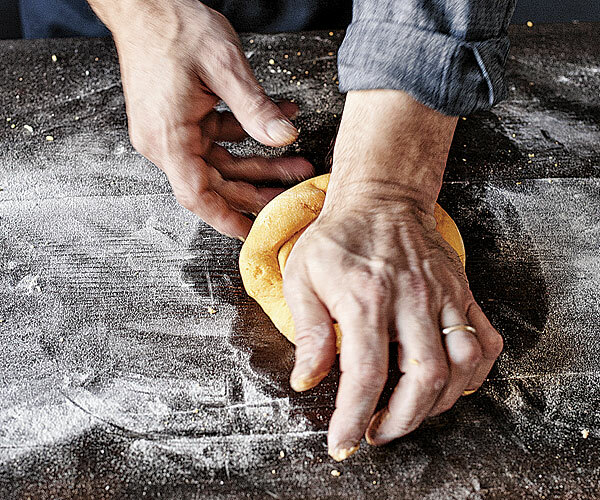 You want plenty of room to roll out the dough without feeling cramped. Sprinkle the work surface with flour so that the dough doesn’t stick, and have all the tools and ingredients you need nearby. Don’t tug or pull on the pasta as it goes through the machine. Let the rollers do the work. If the sheet becomes unwieldy, cut it and continue running each piece through the machine. Don’t worry about rolling the dough to a specific dimension. 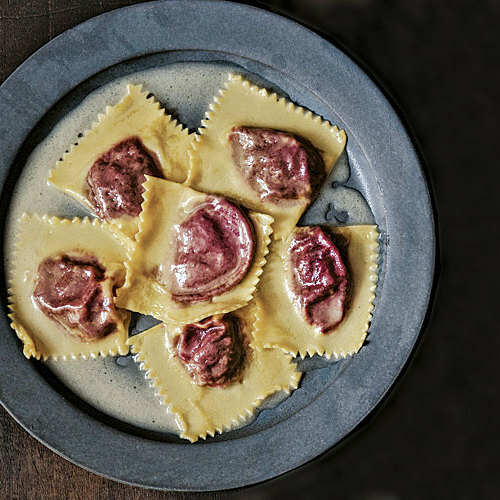 Ravioli is an improvisational art, so work with what you have. When it’s time to fill, lightly mist the sheet with a spray bottle, if you have one. If not, brush it lightly with a damp pastry brush, being careful not to get it too wet. Working with one pasta sheet at a time, very lightly moisten the entire strip. Spoon rounded teaspoonfuls of the filling 1 inch apart along the center of the sheet. Lift the top edge of the strip and bring it down to meet the bottom, letting it fall loosely over the filling and lining up the edges. Using your fingers, gently press on the dough close to each mound to coax out any trapped air, and then press on the edges to seal completely. 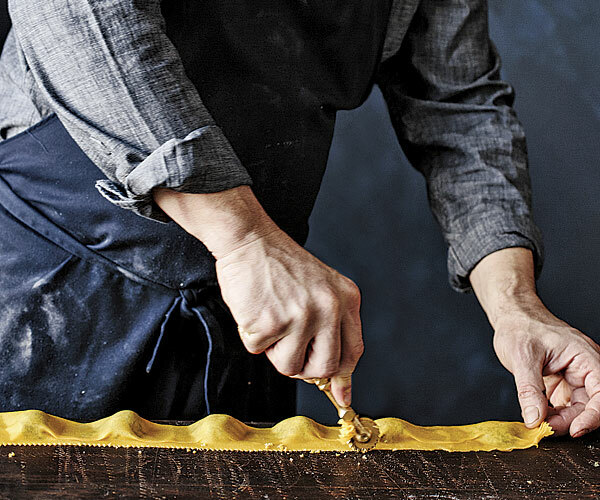 Using a fluted pastry wheel or a knife, trim the long, unfolded edge of the ravioli if you like. Then cut the pasta between the mounds to form individual ravioli. 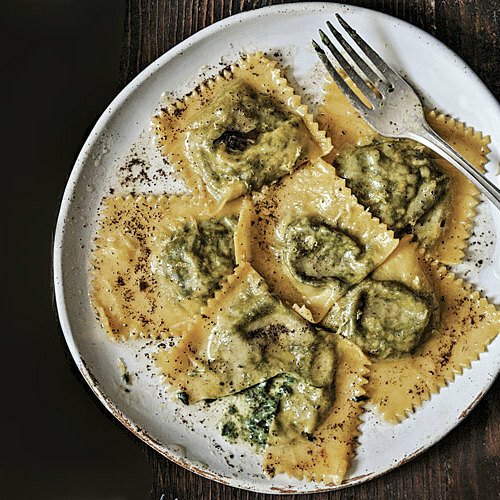 You can cook the ravioli right away or cover and refrigerate for up to a day. You can also freeze them until rock hard on the tray, then transfer to zip-top bags, and freeze for up to a month. When ready to serve, bring a pot of well-salted water to a boil. Gently slide the ravioli (fresh or frozen) into the water and cook until tender, 3 to 5 minutes. Use a skimmer to remove the ravioli from the water as draining them in a colander can damage them. Serve with a simple butter sauce to let the flavor of the filling come though. Garnish with parsley, cheese, or chopped nuts, if you like.